When you want to inspire your daily drive, you want the 2019 Civic Sedan. The exterior styling stands out in a crowd. LED taillights alert other motorists to your presence on the streets of New Orleans and light up your life. Signature C-shaped taillights accent sophisticated body lines and a sleek profile. Climb inside to discover a driver-focused cockpit with connected audio and technology. Under the hood is a turbocharged engine that delivers 174 horsepower in the EX trim and above. The base 2.0 Liter engine standard in the LX and Sport trim delivers a fun 158 horsepower to get you to work on time. Visit Premier Honda in New Orleans, Louisiana to find your Civic Sedan now! If you want to stay in touch with your smartphone while on the move, the new Civic offers several ways to connect. Enjoy the 450-watt, 10-speaker audio system via Apple CarPlay™, Android Auto™, SiriusXM® Radio, and HD Radio™. Your favorite stations, podcasts, music, and audiobooks are available at the push of a button in the new Civic. Another key feature is HondaLink®, which allows you to stay in touch with your car via your compatible smartphone. At Honda, safety is standard. Honda Sensing® is a suite of advanced driver-assist systems and safety systems. Feel secure on the streets of Metairie and Kenner with Collision Mitigation Braking, Road Departure Mitigation, Adaptive Cruise Control with Low-Speed Follow, and a Lane Keep Assist System. Protect yourself, your passengers, and other motorists on the roads of New Orleans with this new Honda. 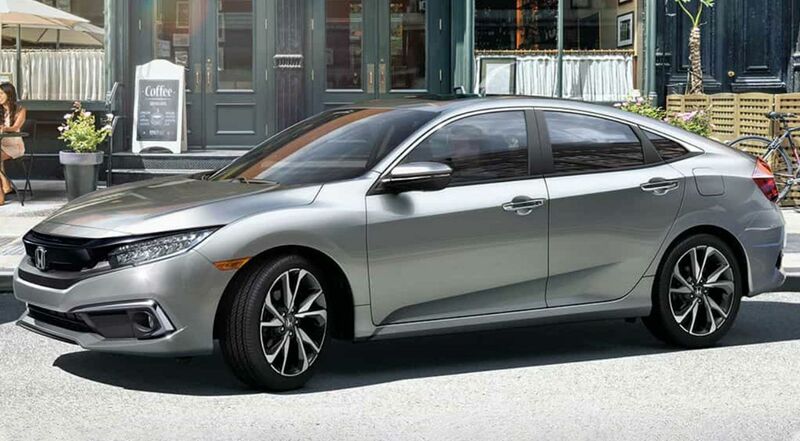 If you are shopping for Honda lease deals, you can stop looking, the 2019 Honda Civic is here. Key systems through the trim range include Multi-Angle Rearview Camera, Leather-Wrapped steering wheel, 8-way power driver's seat, and 18-inch alloy wheels. The interior offers three leather interior color options, a leather-trimmed interior, 60/40 split fold-down rear seatback, and comfortable seating for up to five. When considering your versatility needs, you'll be pleased to learn that the 2019 Civic offers up to 15.1 cubic-feet of cargo space. Choose your new Civic and sit in style. The 2019 Civic Sedan offers a range of desirable trim models and features. The base LX delivers Bluetooth® Streaming Audio. Opt for the Civic Sport to enjoy a Leather-Wrapped steering wheel. The Civic EX adds an 8-Way Power Driver's Seat and 7-inch Display Audio Touch-Screen. Upgrade to the Civic EX-L and enjoy leather-trimmed seats, an automatic-dimming rearview mirror, and HomeLink® Remote System. The top-of-the-line model Civic Touring delivers Honda Satellite-Linked Navigation, LED Headlights, 18-inch alloy wheels, and a 450-Watt Premium Audio System.